Welcome to the online home of The Fish Hunter, Capt. 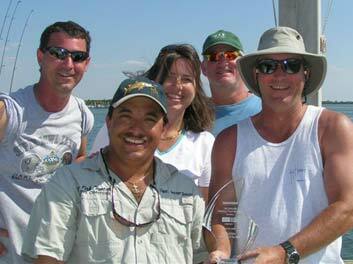 George Hastick, offering guided fishing trips in Tampa Bay and the Gulf of Mexico for grouper, tarpon, snook, trout, redfish, cobia snapper, kingfish and more. Thanks for the fantastic fishing trip! My 6-year-old boy had the time of his life. Thanks for being so patient with him. 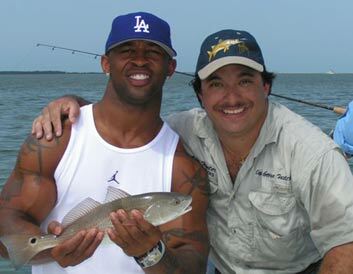 I can't believe he caught so many snook, redfish and trout! It was the best day on the water I have ever had, too, and I have lived here and fished here for over 25 years.I can't wait to go again! The snook are fired up with warming water and bait to feed on. 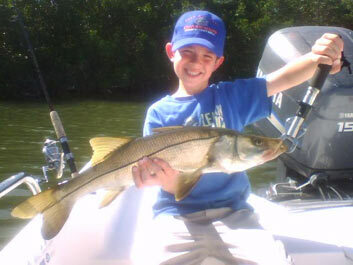 This was one of 18 landed on a recent Tampa Bay trip with 6-year-old Jarrett and his dad. They also bagged reds and trout for multiple inshore slams. It's going down now. 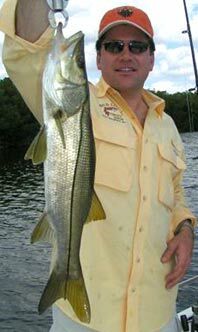 Snook bite: Ray Riske with a dandy snook taken on a recent trip. 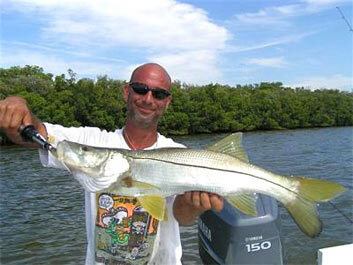 The snook bite is on and if you want a shot at landing one of your own, call or email us now. Bitetracker News Service - Buccaneer Michael Pittman with Capt. George Hastick from the Mike Allstot charity tourney. This redfish didn't place but they did get the fourth biggest trout of the event. Bitetracker News Service - The team of Drew and Michelle Brophy , Rob & Leonard with Capt. George Hastick and the Master Angler award they won today in the Tampa General Hospital benefit tourney- the only team to score a slam. 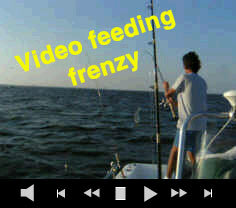 You never know what you will stumble on in Tampa Bay - like a wild and wooly feeding frenzy like this one. Bitetracker News Service - Capt. George Hastick is on a tear, taking his second consectutive tournament win Don with one of three snook and three reds good for the win in the Lindell Properties first annual charity tourney.